Received an Honorable Mention in the mathematics category of the 2017 PROSE Awards! 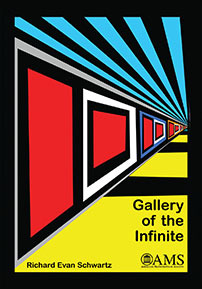 Gallery of the Infinite is a mathematician's unique view of the infinitely many sizes of infinity. Written in a playful yet informative style, it introduces important concepts from set theory (including the Cantor Diagonalization Method and the Cantor-Bernstein Theorem) using colorful pictures, with little text and almost no formulas. It requires no specialized background and is suitable for anyone with an interest in the infinite, from advanced middle-school students to inquisitive adults. Undergraduate and graduate students, researchers, and anyone interested in understanding the nature and properties of infinite sets. The concepts are difficult, but the colorful pictures and relatively few words make it accessible for curious middle-level students and beyond. At first glance, it looks like this book is a quick read, but do not be fooled. Once you begin reading, you will continue to go back and forth, rereading to make the connections...Although the content in the book is well beyond the level of middle school students, this book sparks interest through the creative presentation, which might draw in students who are curious about the topic of infinity...I would certainly have it available to my students with other math books in my library. This would be a great addition to a math library to help students see math in a creative and even humorous way while addressing the important and somewhat complicated concept of reality. Its unique presentation and conversational style makes it a good conversation starter between mathematicians and inquisitive folk with little formal mathematical training, and I can see it capturing the imagination of interested readers from many backgrounds. This book introduces some important and fundamental concepts of set theory to a general audience...very fun to read, it contains very little text, and all the ideas and proofs are illustrated by colorful, funny and mostly self-explanatory images...I would recommend this book for anyone who has the slightest interest in mathematics, both children and adults. This is a lovely book...Although a certain affinity with mathematical reasoning is needed, the book can be read by almost anyone. This is a beautiful book. The pictures keep the reader engaged in a colourful mathematical journey. It is written in an engaging style suitable for over 11's but also contains ideas that are likely to interest most adults...Although a mathematician would likely be aware of many of the concepts the book presents, I would still recommend it both as a tool to intrigue others (it makes a great 'coffee table' book) and also since it contains many imaginative explanations and original arguments. The illustrations and narrative keep the reader entertained and make the book hard to put down.